Tours are run on demand, minimum numbers apply. This is an exhilarating night paddle. Experience the magical light show put on by the smallest of living sea creatures. Watch as your kayak leaves a glittering wake behind you. Dip your hands in and see the sparkles latch to your hand as you withdraw it from the water. Be one of the few to see this natural phenomenon. Also, mullet, flounder and many birds can be seen or heard. Birdlife includes tui, bellbird, kereru, oyster-catcher, pied stilt, reef heron, white-faced heron, dotterel, fantail, grey warbler, kingfisher, harrier hawk, tern, and many more. Just 20 minutes north of downtown Auckland, the Long bay – Okura Marine Reserve has an abundance of wildlife. Bioluminescence is the production and emission of light by a living organism. Bioluminescence occurs widely in marine vertebrates and invertebrates, as well as in some fungi, micro-organisms including some bioluminescent bacteria and terrestrial invertebrates such as fireflies. This is a one and a half hour trip, perfect for experiencing the marine reserve with the family or a group of friends. The evening is spent exploring the Okura River and Karepiro Bay while playing in the bioluminescence. No previous experience is necessary, but a reasonable level of mobility and fitness is required. Kayak tours are run in fair-weather conditions. 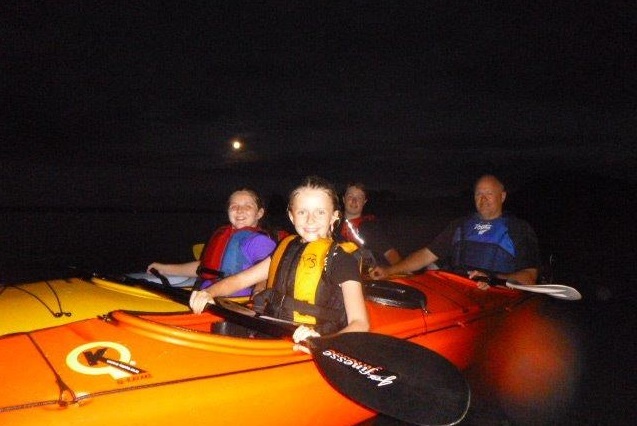 This kayak tour is suitable for children 11 years and over, although younger children over 5 are welcome if the conditions are suitable (each child must be accompanied by an adult). Costs Adults $95, Sorry no Children rates on this trip. FREE digital photos and a guaranteed great time! For departure times and dates see calendar for availability. This tour operates throughout the summer in fair weather conditions. Pickup and drop off at the Albany Bus station or meet us at the launch site. wear well-fitting wet shoes and a lightweight windbreaker/raincoat are recommended. Also bring a towel, sunscreen, sunhat, personal medication, waterproof camera and polaroid sunglasses. Once the tour has finished have a change of warm clothes, thermals, fleeces etc. 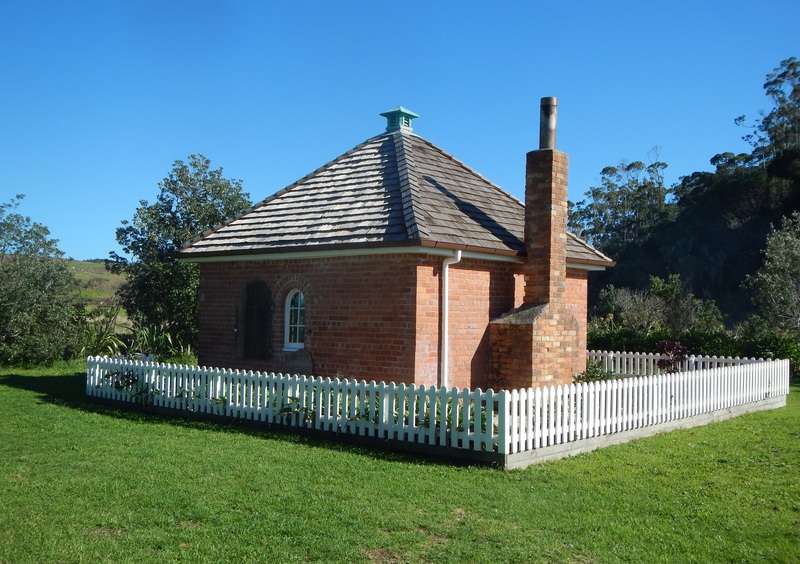 If time allows, you can visit the historic 1850’s Dacre Cottage or paddle past ancient Maori Pa sites. The river water is often extremely clear giving a great view of what is going past under your kayak. Peter Townend, the Owner of the Canoe & Kayak Ltd, is one of the most vocal in preserving this area and your attendance on these trips will help support his and others efforts to protect this stunning river. 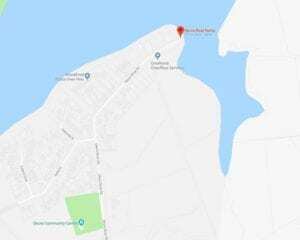 Tours are run on demand, minimum numbers apply – Due to the nature of this amazing experience the tour only runs on evening high tides when the weather is settled. Please contact Canoe & Kayak if you are in any doubt as to whether it will be running. I went on the Bio-luminescence tour and it was spectacular! The guides were knowledgeable and made you feel completely at ease. Would do it again. Must do experience! Want to go kayaking in the next 48 hours? This is a great kayak trip, very relaxed, perfect paddle for beginners (or advanced, actually). Pete takes it as slow as you want with lots of time to check out the bird life at dusk, some secluded beaches/sand spits in the Okura Estuary, and of course the BIOLUMINESCENCE! 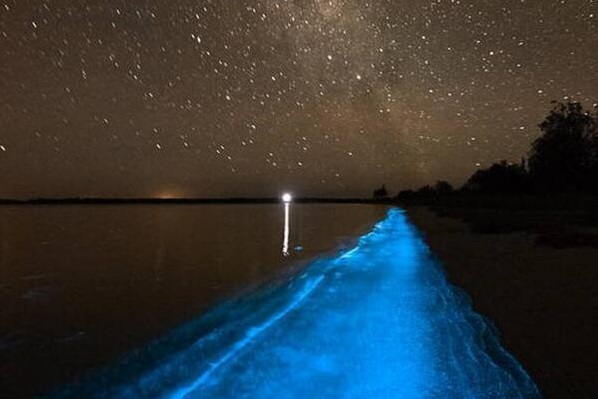 The bioluminescence is so pretty and it feels like you are in a Disney movie. Glowing water off the bow of the boat, blue sparkles when you dip your hands in! It was so amazing, I went out the next day with other friends!! They are still talking about how cool it was. Don’t miss this if you have not seen bioluminescence before. Finally, Pete is a long time resident of Okura, so knows everything about the history of the area. The kayaks are great, you need minimal effort to go fast. There are ZERO waves in the Okura Estuary, so for those who might be unsure, rest assured this is pretty calm stuff.